The capital of Denmark. Shortly after the opening of Denmark in 1657 to settlement by Jews, a number are known to have resorted to the capital. A few were there even earlier; for there is a record of a Jew having been baptized in 1620. The first room for prayer-meetings was opened Dec. 16, 1684, in which year Israel David, the court jeweler, and his partner, Meyer Goldschmidt, were given permission to hold devotional exercises, provided they took place behind closed doors and without a sermon, that there might be no cause for scandal. The Jews were already in possession of a cemetery, the first interment in which is said to have occurred in 1670. This, the earliest known congregation in Copenhagen, probably followed the Sephardic ritual, since the first Jews permitted to settle in Danish cities were of Spanish-Portuguese extraction (see Denmark); though they were doubtless soon outnumbered by German Jews who emigrated from Hamburg, northern Germany, Holland, and Poland, either directly or by way of Sleswick-Holstein. The Copenhagen community is probably first mentioned in specifically Jewish literature in 1691, in which year a number of Jews, bound from Holland to Courland, perished by shipwreck at Marstrand, near the Swedish coast. When the Copenhagen Jews heard of the disaster, they sent two members and the shammash to ascertain the details, according to Jewish law, so that the widows of the drowned men, who were then in Poland, might be enabled to marry again (see 'Agunah; compare responsa "Sha'agat Aryeh we-Ḳol Shaḥal," ed. Salonica, 1746, p. 35a). At that time no Jews were living in Sweden. The condition and mode of life of the Jews of Copenhagen were, on the whole, similar to those of Jews in other parts of Denmark; but jewelers, agents, manufacturers, and merchants of all sorts had better opportunities for business in the capital than in the provincial towns. They soon increased to such an extent that the rooms hitherto used for prayer-meetings were no longer large enough; and the first synagogue was dedicated in 1729. The community had had rabbis for some time. The first was Abraham ben Salomon; he was followed by Israel ben Issachar Berendt, who had officiated as rabbi in Altona, and whose little book "Ohel Yisrael" (The Tent of Israel), a commentary on Jacob Weil's "Schlachtregeln," was printed at Wandsbeck in 1733, a year after his death. 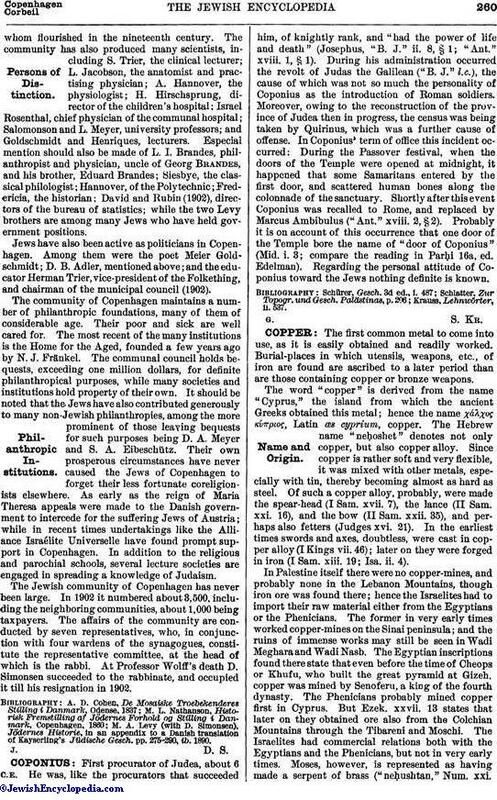 At that time there was no Hebrew printing-establishment at Copenhagen, although Hebrew types were to be found in the common printing-offices. Rabbi Israel died at Fredericia. He was succeeded by Mordecai ben David. Then followed Ẓebi Hirsch ben Samuel Halevy and Gedaliah ben Aryeh, the latter being succeeded in 1793 by his son Abraham, who, in order to accept the post, resigned his rabbinate in Gnesen. Even in the eighteenth century the community was distinguished for its men of culture. A branchof the Wessely family, to which belonged Hartwig Wessely, Mendelssohn's faithful coworker, and his brother Moses, the friend of Lessing, was established in Copenhagen. Although Hartwig Wessely, the most eminent of all the Jews of Copenhagen in the eighteenth century, left his native town, he still kept in touch with it, and when, in 1766, a new synagogue was dedicated, he wrote the dedicatory poem and delivered the oration. Another eminent family, the Wallichs, repeatedly intermarried with the Wesselys; but the Euchel family, to which belonged Isaac Euchel, one of Mendelssohn's foremost pupils, is even better known than either of the other families mentioned. Isaac's equally talented brother, Gottleb, was a business man in Copenhagen, and was also successful as a writer. The community grew rapidly in the eighteenth century, notwithstanding the difficulties attendant upon immigration; but a serious calamity befell it when, in 1795, during a conflagration in the city, the principal synagogue was burned. There had been occasional dissensions in this, as in every other old Jewish community. At the end of the century, however, the movement with which Mendelssohn's name is associated had obtained so firm a footing in Copenhagen, and the differences between the older and younger members had become so acute, that an agreement in regard to the building of a new synagogue was impossible; and, accordingly, none was built. Several houses were, however, fitted up and utilized as synagogues. 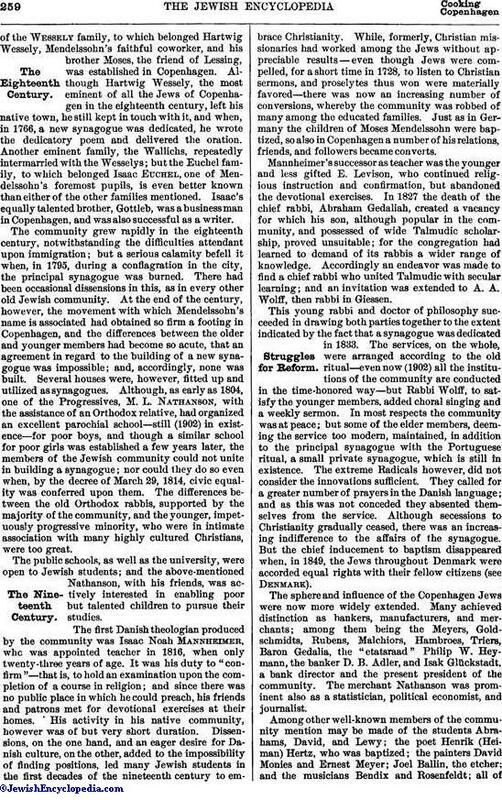 Although, as early as 1804, one of the Progressives, M. L. Nathanson, with the assistance of an Orthodox relative, had organized an excellent parochial school—still (1902) in existence—for poor boys, and though a similar school for poor girls was established a few years later, the members of the Jewish community could not unite in building a synagogue; nor could they do so even when, by the decree of March 29, 1814, civic equality was conferred upon them. The differences between the old Orthodox rabbis, supported by the majority of the community, and the younger, impetuously progressive minority, who were in intimate association with many highly cultured Christians, were too great. The public schools, as well as the university, were open to Jewish students; and the above-mentioned Nathanson, with his friends, was actively interested in enabling poor but talented children to pursue their studies. The first Danish theologian produced by the community was Isaac Noah Manheimer, who was appointed teacher in 1816, when only twenty-three years of age. It was his duty to "confirm"—that is, to hold an examination upon the completion of a course in religion; and since there was no public place in which he could preach, his friends and patrons met for devotional exercises at their homes. His activity in his native community, however was of but very short duration. Dissensions, on the one hand, and an eager desire for Danish culture, on the other, added to the impossibility of finding positions, led many Jewish students in the first decades of the nineteenth century to embrace Christianity. While, formerly, Christian missionaries had worked among the Jews without appreciable results—even though Jews were compelled, for a short time in 1728, to listen to Christian sermons, and proselytes thus won were materially favored—there was now an increasing number of conversions, whereby the community was robbed of many among the educated families. Just as in Germany the children of Moses Mendelssohn were baptized, so also in Copenhagen a number of his relations, friends, and followers became converts. Mannheimer's successor as teacher was the younger and less gifted E. Levison, who continued religious instruction and confirmation, but abandoned the devotional exercises. In 1827 the death of the chief rabbi, Abraham Gedaliah, created a vacancy for which his son, although popular in the community, and possessed of wide Talmudic scholarship, proved unsuitable; for the congregation had learned to demand of its rabbis a wider range of knowledge. Accordingly an endeavor was made to find a chief rabbi who united Talmudic with secular learning; and an invitation was extended to A. A. Wolff, then rabbi in Giessen. This young rabbi and doctor of philosophy succeeded in drawing both parties together to the extent indicated by the fact that a synagogue was dedicated in 1833. The services, on the whole, were arranged according to the old ritual—even now (1902) all the institutions of the community are conducted in the time-honored way—but Rabbi Wolff, to satisfy the younger members, added choral singing and a weekly sermon. In most respects the community was at peace; but some of the elder members, deeming the service too modern, maintained, in addition to the principal synagogue with the Portuguese ritual, a small private synagogue, which is still in existence. The extreme Radicals however, did not consider the innovations sufficient. They called for a greater number of prayers in the Danish language; and as this was not conceded they absented themselves from the service. Although secessions to Christianity gradually ceased, there was an increasing indifference to the affairs of the synagogue. But the chief inducement to baptism disappeared when, in 1849, the Jews throughout Denmark were accorded equal rights with their fellow citizens (see Denmark). The sphere and influence of the Copenhagen Jews were now more widely extended. Many achieved distinction as bankers, manufacturers, and merchants; among them being the Meyers, Goldschmidts, Rubens, Malchiors, Hambroes, Triers, Baron Gedalia, the "etatsraad" Philip W. Heymann, the banker D. B. Adler, and Isak Glückstadt, a bank director and the present president of the community. The merchant Nathanson was prominent also as a statistician, political economist, and journalist. Among other well-known members of the community mention may be made of the students Abrahams, David, and Lewy; the poet Henrik (Heiman) Hertz, who was baptized; the painters David Monies and Ernest Meyer; Joel Ballin, the etcher; and the musicians Bendix and Rosenfeldt; all ofwhom flourished in the nineteenth century. The community has also produced many scientists, including S. Trier, the clinical lecturer; L. Jacobson, the anatomist and practising physician; A. Hannover, the physiologist; H. Hirschsprung, director of the children's hospital; Israel Rosenthal, chief physician of the communal hospital; Salomonson and L. Meyer, university professors; and Goldschmidt and Henriques, lecturers. Especial mention should also be made of L. I. Brandes, philanthropist and physician, uncle of Georg Brandes, and his brother, Eduard Brandes; Siesbye, the classical philologist; Hannover, of the Polytechnic; Fredericia, the historian; David and Rubin (1902), directors of the bureau of statistics; while the two Levy brothers are among many Jews who have held government positions. Jews have also been active as politicians in Copenhagen. Among them were the poet Meier Goldschmidt; D. B. Adler, mentioned above; and the educator Herman Trier, vice-president of the Folkething, and chairman of the municipal council (1902). The community of Copenhagen maintains a number of philanthropic foundations, many of them of considerable age. Their poor and sick are well cared for. The most recent of the many institutions is the Home for the Aged, founded a few years ago by N. J. Fränkel. The communal council holds bequests, exceeding one million dollars, for definite philanthropical purposes, while many societies and institutions hold property of their own. It should be noted that the Jews have also contributed generously to many non-Jewish philanthropies, among the more prominent of those leaving bequests for such purposes being D. A. Meyer and S. A. Eibeschütz. Their own prosperous circumstances have never caused the Jews of Copenhagen to forget their less fortunate coreligionists elsewhere. As early as the reign of Maria Theresa appeals were made to the Danish government to intercede for the suffering Jews of Austria; while in recent times undertakings like the Alliance Israélite Universelle have found prompt support in Copenhagen. In addition to the religious and parochial schools, several lecture societies are engaged in spreading a knowledge of Judaism. The Jewish community of Copenhagen has never been large. In 1902 it numbered about 3,500, including the neighboring communities, about 1,000 being taxpayers. The affairs of the community are conducted by seven representatives, who, in conjunction with four wardens of the synagogues, constitute the representative committee, at the head of which is the rabbi. At Professor Wolff's death D. Simonsen succeeded to the rabbinate, and occupied it till his resignation in 1902. M. A. 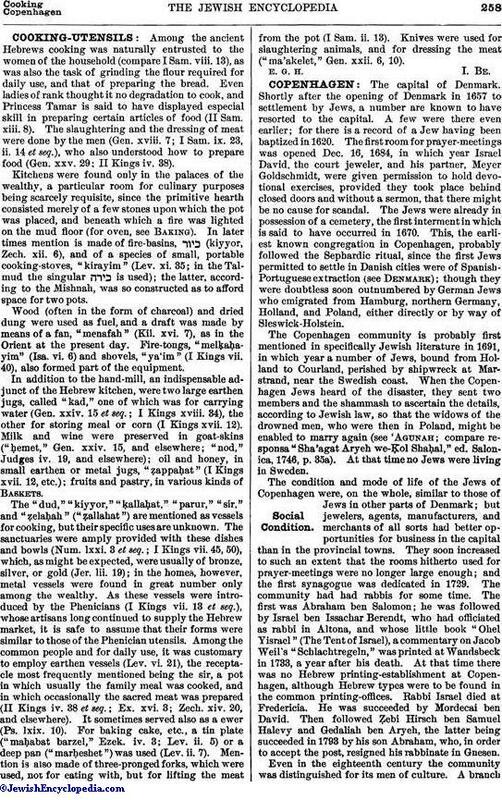 Levy (with D. Simonson), Jödernes Historie, in an appendix to a Danish translation of Kayserling's Jüdische Gesch. pp. 275-290, ib. 1890.